Grass that Needs to Be Divided. Marie Iannotti (2008) licensed to About.com, Inc. Many perennial plants grow in an ever widening clump. After several seasons of growing, these perennial plants will begin to die out in the center and look more like a ring than a clump. To keep the plants vigorous and blooming, a technique known as 'Division' is performed. 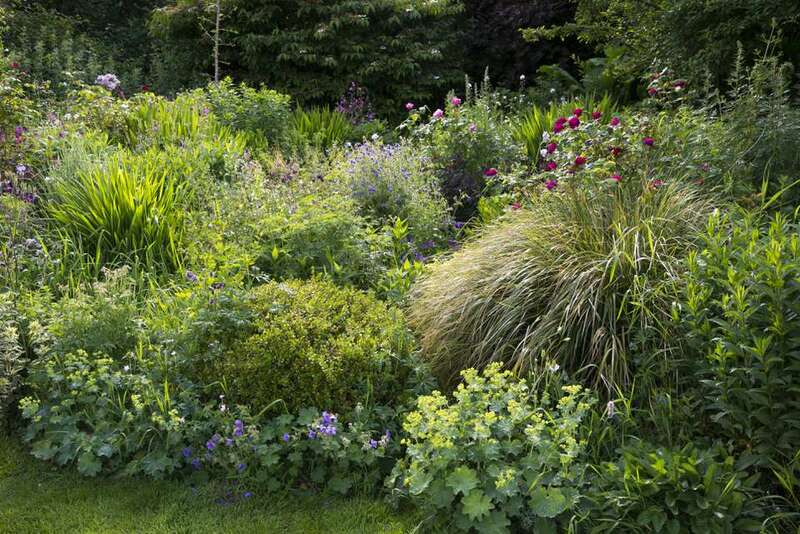 Dividing perennial plants gives you healthier, longer lived plants and the bonus of more plants. When to divide perennials depends on the type of plant and how quickly it's growing. You don't have to wait until your perennial plants begin looking like doughnuts. In fact, it's better if you don't. Keep an eye out for clumps that have grown 2-3 times their size within 2-5 years. Any over grown clump or any clump that has simply exceeded the space allotted is a candidate for division. Spring is usually the best time for division, since the plants are actively growing their leaves are not so developed that the root system can't take a little disturbance and still feed the top of the plant. However, just as different plants can go different lengths of time before being divided, some plants, like peonies, prefer to be divided in the early fall. In the photo here, the daylily has increased in size 3 times and once it is fully grown this season, it will be growing into the neighboring daylilies. Preparing Perennial Plants For Division. It's true that dividing perennials is good for them in the long run. However it is still a shock to their system and giving them a good soaking, preferably the day before you intend to divide, will help your success. Disturbing the root system of any plant interrupts its ability to feed and hydrate itself. Insuring that the roots are well saturated before disturbing them reduces the trauma. If you find you must divide a plant with a great deal of top growth, cutting back the leaves by about 1/3 will lessen the amount of work the roots will need to do to maintain the foliage. This is often the case when dividing bearded iris, after they have bloomed. Know Where the New Perennial Divisions Will Go. Along the same lines as watering your perennial plant well before digging and dividing it, having the new planting hole prepared before you dig will limit the plant's time out of the ground and the stress on the root system. Give your new division plenty of room to expand. Remember the divisions will all be smaller and will require less deep holes than the original plant. Digging Perennial Plants to Divide. In most cases, it is easiest to divide a perennial plant by first digging and lifting the entire plant. If that is the case, use a shovel or flat edged spade and slice completely around the outer perimeter of the plant, a few inches away from the foliage. Slice down several inches deep, at least 6 inches for most plants and more for extremely large, well-rooted plants. The idea is to dig as much of the root ball as possible. Try and keep the soil intact around the root ball. This is an additional advantage of watering the soil around the plant. Wet soil adheres better than dry soil. Once you have sliced completely around the plant, you will see the plant beginning to lift out of the hole. Try lifting the plant out of the hole with the shovel. It may be too heavy to lift this way. If so, use the shovel as a lever and lift the plant manually. Place it on level ground nearby. Dividing Perennial Plants with Pitch Forks. A very common method of dividing perennials is to use 2 pitch forks to pry and split the plant apart. Perennial plants with fleshy roots, such as the daylily shown here, are easily pried apart with forks. Insert the forks into the center of the lifted plant so that the backs of the forks are touching each other and the tines are crossing. Press down so that the forks go through the plant. You will probably hear some cracking at this point. Let's hope it's your plant and not the handle on your pitch fork. In all seriousness, some plants are so dense that this method will not work. Exercise caution, since garden tool handles can break and send you tumbling. Once your garden forks are securely anchored in the center of your perennial, simply pull the handles in opposite directions, away from the center of the plant. Again, you will hear cracking. The roots will not be breaking cleanly, but the plant will recover. Sometimes a densely rooted plant will resist and it will take two people to pull the forks apart and split the plant. And as mentioned in Step #5, exercise caution, since garden tool handles can break and send you tumbling. Splitting Apart Perennial Plant Divisions. Keep pulling on the handles until the plant has completely split into two plants. If the resulting plants are a good size for replanting, meaning not so large you'll have to divide again next year or so large that they don't fit into the space you've allocated, you are done dividing and ready to replant. If you have an extremely large plant, you may have to divide it several times before you have new plants of an appropriate size. Simply repeat the steps above. Dividing Densely Rooted Grasses with an Ax. Most perennial plants can be divided with the simple two fork method described above. Occasionally you will encounter a perennial that has either been growing too long in one spot or that simply has a really thick root system. 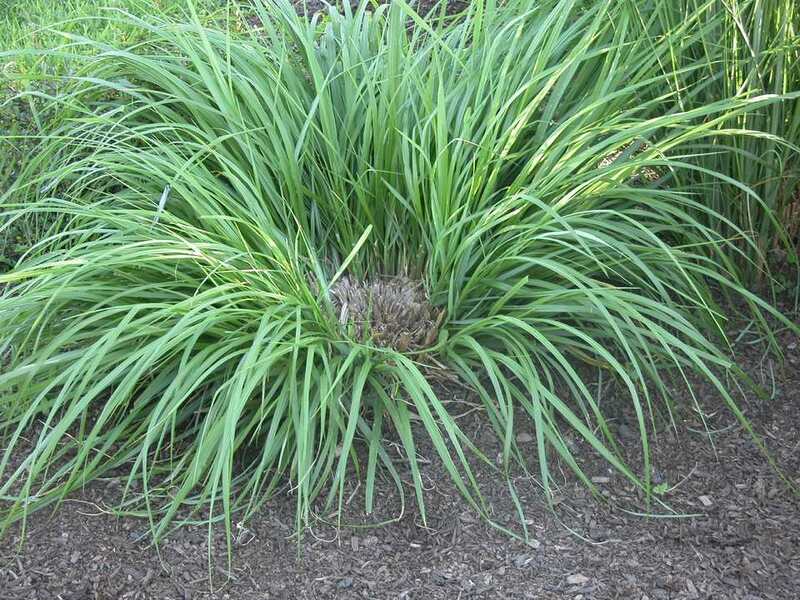 Ornamental grasses tend to develop such heavy root systems that just digging them out of their hole is a challenge. Trying to divide these with the two fork method almost guarantees a broken fork and a very sore back. Densely rooted plants require cutting the root system open. This can be done with a sharp saw, by two people and a bow saw or even with an ax. These methods should all be undertaken with extreme caution. You will hurt yourself a lot more than your plant. Dividing Perennial Plants by Slicing. On the other side of the coin, some plants, like geraniums and Jacob's Ladder, are simply quick spreaders and their root systems are quite easy to dig an separate. In this case you do not need to lift the entire plant. This Jacob's Ladder has out grown its space and a portion near the border edge is being chopped with a shovel and lifted. You will still want to pre-water your plant and take as much of the root ball and soil as possible, but you do not need to dig and disturb the hole plant to reduce its size. Sometimes you just want to chop a piece of a plant off to give to a visiting friend. This method should serve you well then. Caring for Recently Divided Perennial Plants. Don't leave the exposed root ball sitting about any longer than necessary. Hot sun and breezes will quickly dry the roots. Provide some shade if they appear to be wilting during the afternoon. A floating row cover will protect them from the hot sun. Perennial plant division is intimidating when you first think about tearing apart your precious plants, but the more you do it, the better you will get at it and the better your perennial plants will grow.